At a town hall meeting Tuesday night meant to update the public on the status of Flint, Mich.’s water system, government and independent experts told the gathered crowd that the city’s lead-contaminated water system is improving. But after a year of being told one thing and later finding out another, the people were unmoved. Flint’s water problems began in 2014 when, in an effort to save money, the city began drawing drinking water from the local river; improperly treated river water damaged the city’s pipes. Mark Durno, who is with the federal Environmental Protection Agency, told the crowd that tests show that efforts to repair the damage done by improperly treated water are having an effect, Michigan Radio reports. “Lead levels are substantially reduced. Orthophosphate is doing its job recoating the pipes. Chlorine levels have improved and stabilized throughout the system for effective disinfection,” Durno said. Durno’s comments to the crowd Tuesday night were echoed by Robert Kaplan, acting administrator for EPA Region 5, in an interview with Michigan Radio Wednesday. Kaplan’s conclusions were a result of a closed-door meeting Tuesday with officials from the Michigan Department of Environmental Quality, Virginia Tech, EPA experts from Flint, and the Centers for Disease Control and Prevention. Kaplan also indicated that the chlorine was working to disinfect the system without any harmful byproducts. Yet even with all this talk of improved water quality, state and city authorities as well as the EPA still advise residents to use filtered or bottled water. 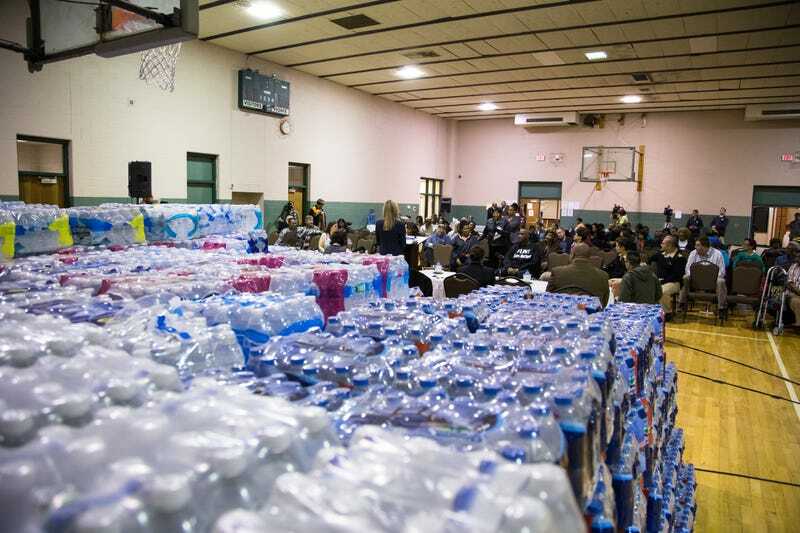 According to Michigan Radio, filters and bottled water may be the requirement for years to come while the city replaces the damaged pipes that connect homes to city water mains. Having been told many times before that the water situation was “OK” or “improving,” only to later find that that wasn’t the case, those present at the town hall meeting Tuesday evening did not conceal their skepticism. Michigan Radio reports that whenever a panelist spoke about Flint’s improving water quality, some people in the crowd crinkled water bottles, the sound serving as a gentle reminder that residents have been relying on bottled water for everything from drinking to cooking to bathing for more than a year. Flint Mayor Karen Weaver told NPR that her city’s residents are tired of government assurances that things are getting better. “We’re angry. And we’re scared. And we’re confused And we sure don’t trust,” Weaver said. Read more at Michigan Radio.